Today we just wanted to mention the precious work of the catalogue related to the exhibition "Tracce del secolo breve" ("Traces of the Short Century") curated by Piero Del Giudice and hosted in two different venues between 2014 and 2015. When an exhibition is over the catalogue remains as a precious tool and documentation of the work the curators have done. The exhibition was hosted in Trieste and Trento (the two cities of Italian irredentism), the first time at Magazzino delle idee between November 2014 and February 2015 and the second at Castello del Buonconsiglio, between April 2015 and September 2015. 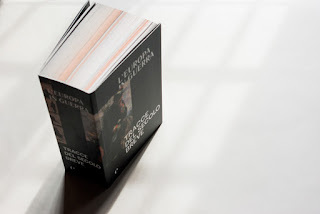 This huge catalogue (see the picture beside, curated by Piero Del Giudice, 1150 pages, edizioni ‘e’, Trieste, € 35,00) is a collection of essays, an anthology of poems and prose, a selection of letters and diaries, a great gallery of drawings, paintings and etchings. The point of view of the curator and his collaborators is far from the main tone of the Centenary celebrations, since they look deeply inside the movement of protest against the war. The catalogue reflects the structure of the exhibition that was divided into three sections: the first dedicated to the devastation of the soldiers in the trenches, the second to artists and their opposition to the war and the third to religiousness and devotion.